At the end of January, I accompanied TCF Board Member and Advocate Extraordinaire, Lisa Friday on a trip to both Rock Springs, Wyoming and the Onaqui Herd Management Area southwest of Salt Lake City, Utah. After we landed in Salt Lake, we hit the road northeast to Rock Springs. The next morning we visited the Rocks Springs Short Term Holding Corrals near the Bureau of Land Management Office on the north side of town. Over 600 wild horses are currently confined in dirt corrals with virtually no protection from the weather, which frequently includes biting winds out of the west and winter temperatures below zero. From the public viewing platform we stood on the lee side of a sign to get out of the brisk wind and to watch the once-wild horses below us. Some from the North Lander Wyoming herd have been here since late 2012, however, most are the Salt Wells Wild Horses captured two months ago. Hundreds of mares, some with foals were crowded in corrals with little opportunity to run or to get out of the wind. North Lander mustangs behind bars. Salt Wells mares and foals in crowded corrals. An hour later, we were sitting in a meeting with BLM District Manager, Mark Storzer, and Resource Advisor, Kimberlee Foster. Lisa and I were there to get acquainted and to encourage the BLM to accept our help in constructing wind breaks for the horses. It was a good meeting with a respectful conversation and we felt that the BLM might be open to our offer to help protect horses that could be incarcerated in this feedlot style facility for years. “Short Term Holding” areas used to be just that. Horses would be corralled, freeze branded, given their shots and males would be gelded. Then younger animals would be made available for adoption in Rock Springs and elsewhere. Older animals used to be released back on the range but in recent years have been removed and sent to long-term pastures. But, the long-term pasture areas are full now and adoptions are down as well. Unfortunately, this has not deterred the aggressive BLM helicopter roundups in lieu of bait trapping and use of the safe, dartable, reversible, and effective PZP vaccine. Exposed Rock Springs corrals. Salt Wells mares and foals in crowded middle pen. Lisa and I are trying to make the best of a bad situation, offering ideas to make the multi-year confinement of these once wild, freedom-loving animals more humane. Although we felt good about our visit with Mark and Kimberlee, the National Office will have to approve our offer of help. As yet, I have been unable to get a call back from Wild Horse and Burro Chief, Joan Guilfoyle. As I have often contended, the field people on the local level want to do what is best for the animals, but do not always have the authority to act or the support of their bosses. I hope this is not the case with the Rock Springs Corral situation. Also, I have not been able to meet with Interior Secretary, Sally Jewel to make the case for less costly and more humane management of our remaining wild horse and burro herds. The uplifting part of our Wyoming journey included an afternoon drive up on the snowy White Mountain Wild Horse loop just north of Rock Springs. After a dozen misidentifications (“Sage” and “rock” horses are abundant in White Mountain!) we found our first real wild horse band a half mile or so off a drifted side road. I tried to walk closer to the small band, but found myself knee deep in the slabby drifts that held me up one second and gave way to my weight the next. I had to settle for distant images. We spotted a couple of bachelors wandering nearby and one handsome fellow did us a favor by walking across the road 100 yards in front of the car. He stopped to eat some snow, casually glancing our way before he ambled on. The next sighting was near the end of the loop. A band of 10 wild horses were foraging close to the road. Trailing the band was a Curly bachelor stallion. The big sorrel had a wavy mane, tail and coat, characteristics of this rare and hardy breed. Jay D’Ewart, the BLM Wild Horse and Burro Specialist for the herd, confirmed that there were still some Curlies in the area and he had released a Curly stallion in the last roundup. We watched the horses interact with each other and nibble for scant bits of grass. I know both Lisa and I felt privileged to spend time with these rugged survivors. We drove back to Salt Lake and the next morning we met Utah Wild Horse and Burro Lead Gus Warr, Public Information Officer Lisa Reid, Field Manager Bekee Hotze, and Wrangler Tami Howell. They were kind enough to take the time to show us a wild horse herd management area called Onaqui, adjacent to the Army’s Dugway Proving Ground. 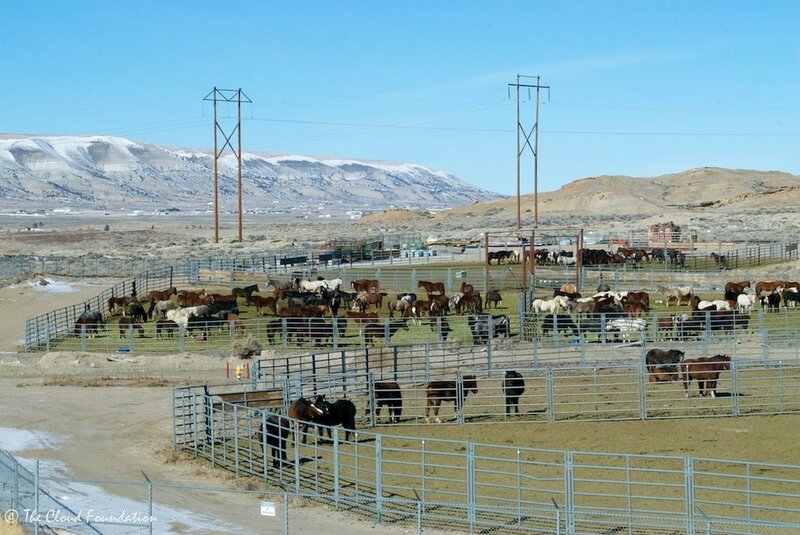 From November through February the 250 wild horses share their home range with over 800 head of cattle. Typical of cattle use, the blacks cows were in the low valleys but the mustangs were mostly on the high hills and the BLM led us to over 40 wild horses in multiple bands. The view and the colorful mustangs were breathtaking! There were pintos of various shades, bays, blacks, grays, palominos, grullos and sorrels. They raced across the hillside below us with the open valleys and distant mountain ranges beyond. I expected them to keep running but they slowed and started to graze. With Lisa Reid’s encouragement we walked slowly toward them and set up our camera. They stared at us curiously and then continued foraging. What perfect candidates for field darting using the reversible, one-year vaccine, PZP. Several months ago I chatted with Lisa Reid about beginning “on the range management” of wild horses in Utah, with the ultimate goal of balancing reproduction with mortality, thereby allowing all foals born to live their lives in freedom. To our surprise, Gus and Lisa, along with Bekee and Tami had already begun formulating plans to dart the mares to limit reproduction to mortality. We were thrilled to hear this and offered our help in making this minimally invasive technique a reality. It is our hope that Onaqui will prove to be the first of many such agency-wide efforts to end the stock-piling of wild horses in costly, tax payer funded corrals and pastures and to allow them to live in freedom. If the National BLM Office supports the Utah initiative, there will be an Environmental Assessment (EA) developed, which the public can read and comment on. 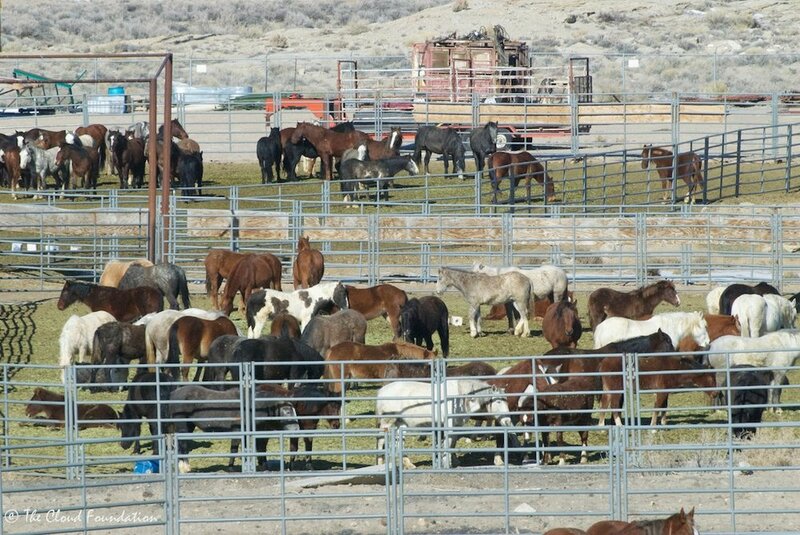 We will let you all know if and when this EA is available for comment and we hope that many of you will support this effort by BLM to manage the wild horses without helicopter roundups and life-long confinement. Thanks Lisa Friday for sharing this journey with me and for being such a dedicated advocate on behalf of mustang freedom. And thanks to all of you for your support of our efforts to keep wild horses safe with their families on their home ranges in the West! PS. Coming soon, an account of our exciting adventure in the very snowy Pryor Mountains of Montana.